Chapter 2 of “The Stiff” was drawn & written two years after chapter 1. I finished Chapter 1 in 2001, but then I got distracted by life, including by an extremely busy work schedule. It was one of my longest fallow periods away from comics. 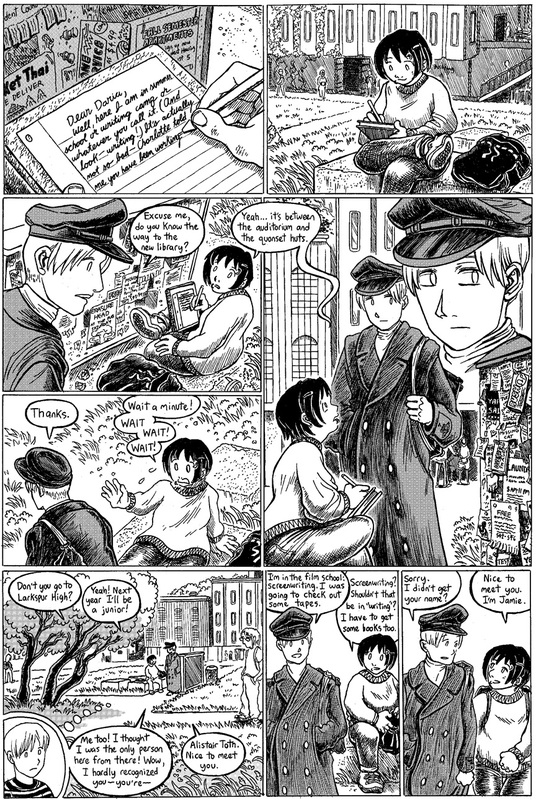 Eventually I got the hunger to draw comics again, and in early 2003 I accepted the offer from Lea Hernandez to submit a comic to a then-new website, “Girlamatic.com”, an early site for women’s and women-friendly comics. Girlamatic was a good website for several years. In addition to Lea, people who worked on the site included Hope Larson (who told me how to use the multiply tool in Photoshop), Dylan Meconis, Svetlana Chmakova, Tintin Pantoja, my friend Shaenon Garrity and many, many other excellent artists. Unfortunately, like the other sites run by the same group (including Modern Tales and Serializer) it gradually failed due to its subscription-based pay system. At the time, the era of Scott McCloud’s “Reinventing Comics,” subscriptions seemed like a reasonable way to make money off of comics, but in practice it was a huge barrier for people checking out the site, so it was difficult to gain new readers and eventually the sites stagnated. However, if I hadn’t met the Girlamatic people and been a part of that community, I might never have gotten back into drawing comics, or at least it would have been in a very different way. It was a ton of fun drawing comics on their site. RIP Girlamatic.